Ellis Bella Ballet girl's crossover wrap skirt is well made with georgette material it drop really well and give a smooth look, matching colour nylon Lycra tie at the back close at the front, it is regulation RAD ballet skirt. just right cutting, for great appearance, a continue of child pull on skirt, which is easy fit for a growing children. and size available up to adult Medium and adult Lge. 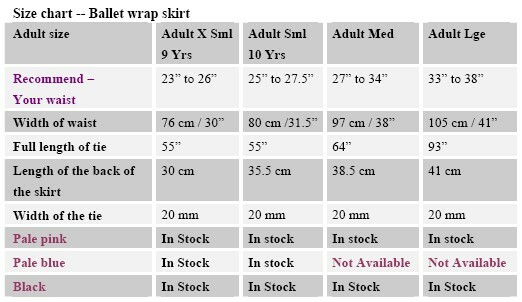 Contant : skirt made of georgette material, Bright Nylon spandex lycra waist band.